We’ve been fostering dogs from SICSA. We have two older big dogs and they are good trainers for young whippersnappers. Plus, they come to my office every day with me. 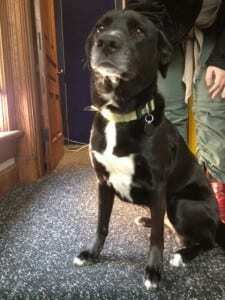 Last Friday I went to pick up Akeeli, a black Lab mix. They told us she was a 1-year-old puppy, about 45 lbs., who had been adopted and returned because she had severe separation anxiety (the new owner only kept her from Friday to Monday before bringing her back). She wasn’t doing well at SICSA in a cage (they didn’t tell us she had stress diarrhea until after we got her home- but, we never saw evidence of it). She immediately bonded with me. I’ve never met a dog quite so loyal or faithful- so trusting so quickly (my dogs have always found me- after being abused). She doesn’t like me to leave her- even when I’m in the bathroom- she sits outside the door and waits. She will jump up gently to greet people, and practically does pirouettes on her hind legs when the leash comes out. She’s great with kids, other dogs and old people. She’s totally housebroken, doesn’t chew on things (except dog toys), she’s perfect in every way except she will bark when left people-less and still whimpers when I leave. She will take off if given a chance, but comes to me. When the 8-year-old let her loose the other day- she ran directly to my office, looking for me. Needless to say, I hate to take her in for adoption today, starting at 11 am. But, I want all of you to consider this wonderful dog who needs a good home. The adoption fee is about $150. She’s already fixed. She knows her commands and is smart as a whip. I think she’s older- although her teeth are perfect, I think she’s probably closer to 3 or 4- because she can settle down just fine, despite having a lot of energy when it’s time to play. She will be very stressed out in the kennel, so take my word for it- you get her home, she’ll be the best dog you ever had. And, if for any reason you need a dog sitter, she’ll always be welcome here. SICSA is at 2600 Wilmington Pike, Dayton, OH 45419 (937) 294-6505 You can come see her starting at 11 a.m.
She may be good in a home with other dogs. My dog used to have really bad separation anxiety… almost the exact same reactions and everything. We found it helped him to have another dog around to help him part with us so that he wouldn’t be alone so to speak. If she’s good with other dogs… it might be something to take into consideration. Best of luck with her! She is a cutie! I have to tell you, it was heartbreaking leaving her in the pen at SICSA today. I miss her already. I opened my front door to you. You looked at my dog and said “i dropped off a dog nicer than you at SICSA today.” Who do you think you are? Get some therapy, dude. In response to Crys Mitchell: Her dog had just nipped her. Akeeli doesn’t bite people, especially, the one who feeds her. I would suggest therapy for her dog- and a sense of humor for her. If the dog wasn’t nipping at you, you had no place to comment. It’s no different than someone making a snide remark about your kid, after ringing your doorbell, unsolicited. @Crys Mitchell it sounds like you’re not able to take a joke. Maybe you should be the one putting yours up for adoption, because if you can’t handle the little things, how the hell are you gonna raise a pet? It sounds like your dog doesn’t even like you. @Allison it sounds like you’re not able to take a joke either. If your logic is a kid = a dog it kind of makes me wonder what kind of house you live in anyways. I’m guessing your kid occasionally nips at you? This post is about a lovable dog. He’s just trying to find an amazing home for her. You’re the ones inhibiting this searching process instead of helping out one of man’s best friends. Well, it’s been a long time- but, finally, today, a family with three kids and a stay at home mom took her home. I’m happy she’s found a family- but, I think I’m going to miss her- and I know Buddy will. He liked having a younger girlfriend around the house. Now the question is what will T and the girls decide to foster next?